On Sunday, it was World Health Day. At SolarAid, we’ve worked closely with partners over the years to bring power and lighting to health facilities across Tanzania, Kenya, Malawi and Zambia. We believe that access to electricity is a vital ingredient to enable a health facility to provide access to quality health care. In many of the communities where we work, rural health clinics have limited, unreliable or no access to electricity. In some cases, expectant mothers have to arrive at the clinics with their own kerosene lamps or candles to give birth at night. We have heard stories of horrific injuries to mothers and babies caused by these dangerous lights sources. 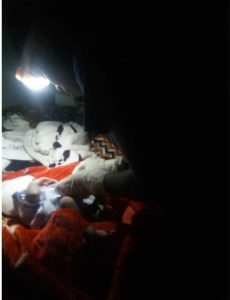 Nurse Chishala delivering a baby by the light of an SM100 as she arrives in the world at night. Today, we’d like share an incredible story from Zambia. Just two weeks ago, our team met up with Chisala, a nurse at the Kayipaka rural health centre in Ikelenge, North Western Province. Chisala told us that, on 20th March, a baby girl was born during the night. This birth was different, however. This baby was delivered with the help of the light shining from an SM100 solar light, strapped to the nurse’s head. So this baby girl was not born in total darkness. This baby was not born with the threat of a candle catching fire or where the first thing she smelled were fumes from a kerosene light. She was born under safe, clean, light. Small things like this, make a big difference. We are determined to create a world where no baby is born into darkness and will continue to work with health providers and partners to achieve this.